After a soft and soggy start to 2017, the mercury dropped, giving the winter racers in the area the gift of thick ice. The Kahnawake Marina Super Series hosted its second round of ice racing last weekend in four divisions. In the newly-added MF44 front and rear-wheel-drive divisions, Jean Guy Labrecque took the FWD checker, while Brent Stalk held off Josh Maracle to win in the RWD. “It’s a lot of fun,” said Stalk of driving in the new category where tires are equipped with screws sticking out of the tires, providing greater grip. 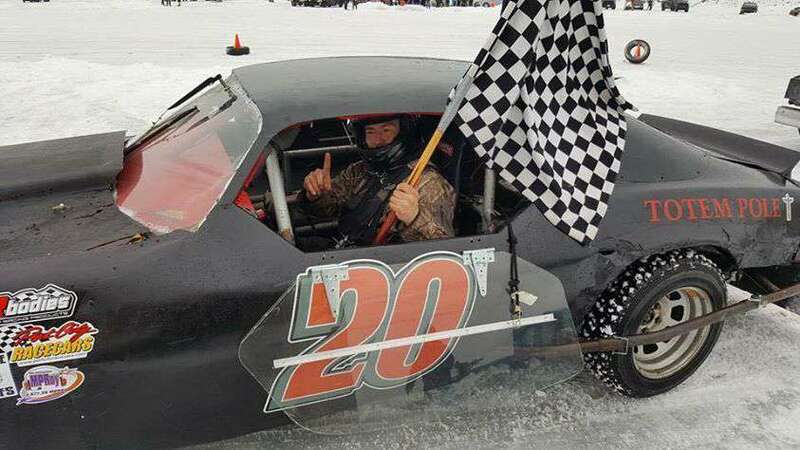 Organizer Brandon White is excited about the new studded categories, that, he says, add an ideal way for racers to enjoy the sport without breaking the bank. Safety and cost were determining factors in adding the class where a stock car can perform much better with the help of the studs. “That’s the whole philosophy of that class, a low-budget class with not a lot of horse power needed to spin those,” said White. With pins, a car with a lower horsepower (a stock car for example) can race competitively, making it easier for those without huge funds to enter. In the standard rubber tire categories, it was NASCAR vets Derek White (RWD) and Dexter Stacey (FWD), who took the checkered flags Saturday. “It’s been good and fun,” said Stacey of the first two weeks. Stacey beat out his partner Skyler Taylor on the weekend to win. “We were racing back and forth with each other,” said Stacey. Taylor won the week prior. “It’ll be good this weekend,” said Taylor getting ready to take back the crown. White has been impressed with the quality of competition this year thus far. White remains vigilant in keeping an eye on the tempers and tensions that arise to ensure things don’t get out of hand. With racing comes rivalry, and in eliminating the Junior category this year, it pushed the young racers into the adult class. The young guns, who need parental permission to race, came out of the gates strong, but did not fair as well in week two. “They had a good first week, and then the second week they kind of fell in the middle, so they got their hopes up thinking they were going to win, but it doesn’t always go that way,” said White. White is hoping for six more weeks of racing, weather permitting. Security and safety remain at the top of the priority list for the organizers.